These transcriptions are presently available on a disc of .pdf files: $15 alone; $10 if included with an order for the 6 CD set (see my publications).2 If printed out they could be made into the three ring-bound photocopied volumes totalling 380 pages of staff notation depicted at right. Commentary on the transcriptions is all on the present website. 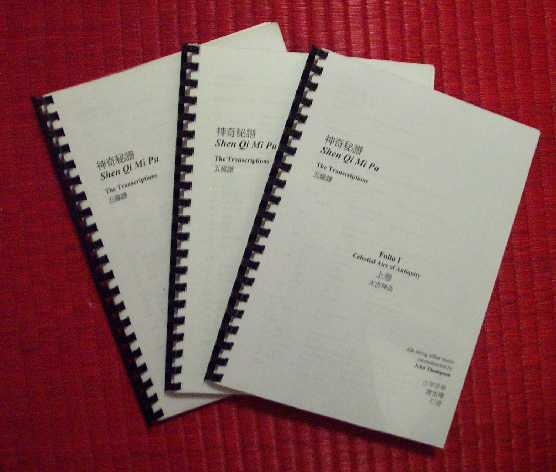 The transcriptions follow the music as played on the Shen Qi Mi Pu CDs. The staff notation was written using Encore music notation for the notes, with the original tablature added onto printouts of the notation. The transcriptions are in the same basic format as the notation for Music Beyond Sound. However, whereas the barlines in the latter follow the phrasing of the lyrics, the barlines in the Shen Qi Mi Pu transcriptions largely suggest a duple meter. This is something not always apparent to the listener of the recordings. The reason for this is that the transcriptions are of the music actually played, but of the music as I hear it. My work in doing the reconstructions largely consists of looking for structures. Once I have found them, I tend to interpret them more and more freely. Seeing these structures should help the listener appreciate how the music should vary from the these underlying structures. In other words, if people unfamiliar with the music listen to it once or twice while following the transcriptions, they should quickly have a sense of what the music is trying to express. Please note that the transcriptions use Western staff notation as though they are the Chinese number notation. In other words, C is not the modern C or the baroque C, but the relative note do, corresponding to the Chinese gong or 1. This is because there is no absolute tuning with the qin: the actual pitch of the strings depends on such variables as the size of the qin, the quality of the strings and the temperature, as well as the taste of the player. There are further comments on this under Modality in Early Ming QinTablature. In 2000 I made a limited number of photocopied sets of these transcriptions, as depicted in the illustration above. These consist of three ring-bound photocopied volumes totalling 380 pages of staff notation. There is no commentary provided with the transcriptions, other than what is on this website.